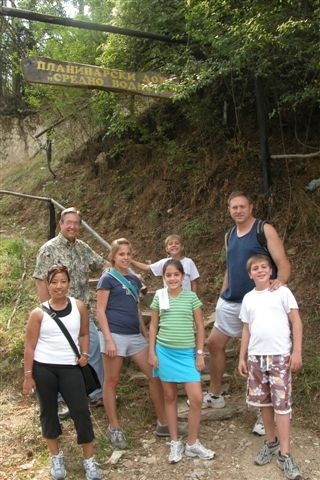 Carole writes, "Ken walked to the top of the mountain with some embassy employee friends and their children. We all left about 10:30 a.m. and those who made it to the top (all the ones pictured) got back down about 3:30. At the top is a beautiful gold cross that lights up every night and can be seen from almost anywhere in the capital city of Skopje, Macedonia. Sadly I had the camera and Ken did not as he reached the top. Now I'm trying to get our driver to drive me to the top so I can get pictures!"